- Weather: weather information (from Weather.com) for 5 days. Icons by HipHopium :-). - Recycle Bin: shows the number of present files and their size. It also shows the rate of replenishment of the trash. - Volume: left click on the percentage increase sound & right click decrease sound. Mute option and current audio device (left click to change it). - SWAP: shows total, used and free SWAP (GB é percentages), bar for free SWAP. 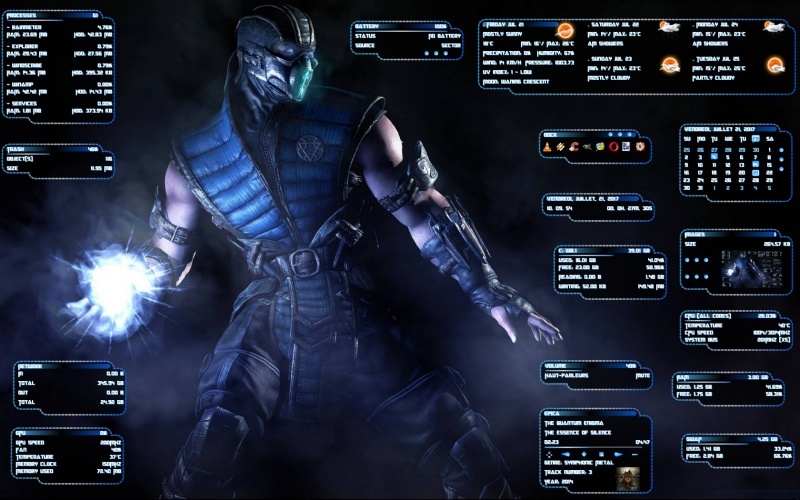 Wallpaper Sub-Zero. Original author unknown. Nice work --- lot of it!! Thanks a lot . Glad you like it .